Uruguayan coach Martin Lasarte has signed a one-and-a-half-year contract with Egyptian champions Ahly on Sunday according to the Cairo giants’ football director Sayed Abdel-Hafiz. “Lasarte is officially our new coach after signing the contract following a meeting with club president Mahmoud El-Khatib,” Abdel-Hafiz told reporters without disclosing the deal’s financial details. 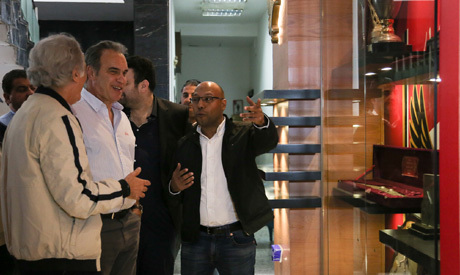 After reaching an advanced stage in the discussions with Lasarte, the 57-year-old tactician arrived in Cairo late on Saturday to finalise talks with Ahly’s management over their vacant managerial seat. The details of the deal with Lasarte will be announced in a press conference on Monday according to the club's official website. Ahly have been led by caretaker coach Mohamed Youssef since Frenchman Patrice Carteron was sacked last month following a bitter loss to Tunisia's Esperance in the African Champions League final and elimination from the Arab Zayed Cup in the last 16 stage. Youssef will be the assistant coach of Lasarte; the same role he played under the guidance of former coach Carteron. Lasarte is an experienced boss who led a handful of clubs in Uruguay, including River Plate and Nacional. He led the latter club to the domestic league title in 2005 and 2006. His other achievements include steering Universidad Chile to the 2014 Apertura title and Copa Chile the following year. He also had spells outside South America with Emirati club Al-Wasl and Spanish side Real Sociedad. Ahly have played just 10 league matches as opposed to 17 played by other teams due to participating in both the Champions League and the Arab Club Champions Cup (Zayed Champions Cup). On Sunday, the Cairo giants continued their recent revival in the Egyptian League following a run of poor form, beating Talae El-Geish 2-0. The victory was the third successive league win under caretaker coach Youssef. Ahly currently lie eighth on the league table with 20 points from 10 matches, 15 behind arch-rivals Zamalek, who have played four more matches.